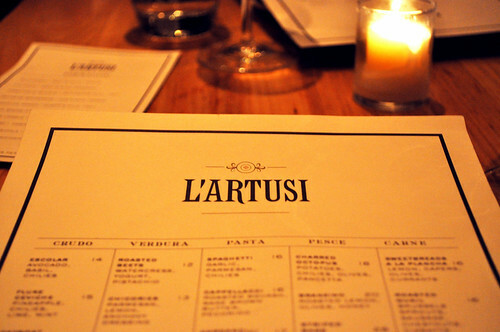 To start off 2012, I had dinner at L'Artusi of the West Village with a former bean-counting colleague, Christine. We were both looking to go somewhere that both of us have not tried before. When on the search for a nice place to go, I stumbled upon L'Artusi on Immaculate Infatuation, which reviewed and granted the restaurant 9.0 on a 10-point scale, gaining the title of one of their "favorite restaurants in this town." 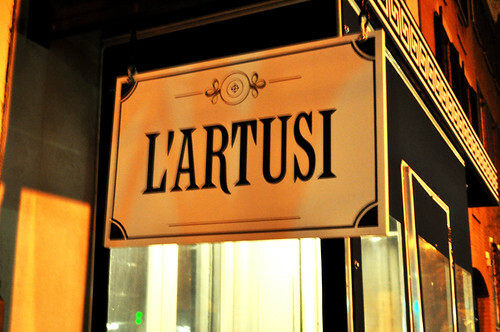 Figured it was worth checking out if these guys over at II spoke so highly of L'Artusi. The restaurant's name, I believe, is an homage to the famed Italian cookbook author of La scienza in cucina e l'arte di mangiare bene (i.e., Italian for "The Science in the Kitchen and the Art of Eating Well"). In fact, the restaurant's tagline is the latter part of the cookbook's title -- l'arte di mangiare bene. We had an earlier reservation at 5:45 on a Sunday night -- the latest reservation I could make via OpenTable that night. So I was a little taken aback when I saw that the restaurant was mostly empty when we arrived, minus a few individuals chatting up at the bar. My initial apprehension was dissuaded away once more dinner guests arrived for their later reservations. By 6:30, the restaurant was booming, where the silence was now replaced with soft chatter, clinking glasses, and plates being whisked in and out of the kitchen. The space at L'Artusi was designed by Brooke Maples. There are two floors of banquette seating, an extended traditional bar, cheese bar, and a chef's counter overlooking the open kitchen. The restaurant also proudly houses a 2,500 bottle walk-in wine cellar. 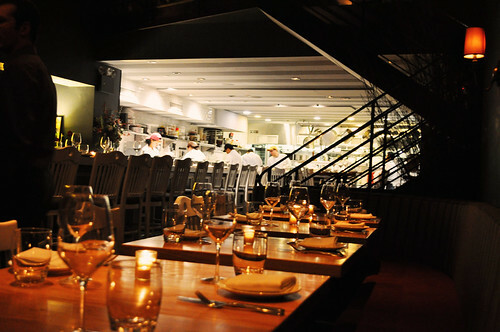 The kitchen at L'Artusi is led by none other than Chef Gabriel Thompson. In his early 20s, Chef Thompson enrolled in Le Chef Culinary School in Austin while working at Granite Cafe (also in Austin), and upon graduation, he traveled through Europe to "experience different cultures" and found that "in Italy, unlike other countries he had visited, he enjoyed every meal -- whether it came from a cart on the street or a fine-dining establishment" -- which he "attributed this to the Italian's use of fresh and local ingredients and simplicity." After his travels, he returned to work in restaurants across the United States (including Portland, Aspen, and Austin) "to learn more about the seasonal and local movement." Three years later, he found himself working in the kitchens of Chef Eric Ripert's Le Bernardin as well as Chef Mario Batali's Del Posto. His time in these established kitchens allowed for him to become the executive chef for the first time at dell'anima, which opened in October of 2007, where he was able to work on a "much more intimate scale." A little over a year later, Chef Thompson went on to open L'Artusi with an open kitchen and a crudo bar. I love the format of the menu. Perhaps its the inner Excel nerd in me that particularly enjoys well-organized columns and grid-style layouts. In any case, the menu is divvied up into Italian "ingredient" categories, regardless of serving/portion size, like crudo for "raw" things, verdura for "green" things, pasta for bowls of shaped starch, pesce for "fish" or sea fare, and carne for "meat" -- all nicely organized. Per a strong, nearly insistent, recommendation on part of our waiter, Christine and I started off with the roasted mushrooms with pancetta, fried egg, and ricotta salata. 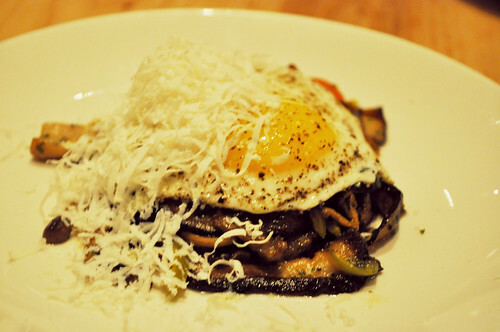 Arguably my favorite course that night, the runny yolk from the fried egg over the well-seasoned (very peppery) mushrooms had us at first bite. They reeled us in, wanting more after every taste, and the roasted mushrooms were wistfully gone in a matter of seconds. The saltiness of the pancetta added a balanced meaty and savory context, almost as if it was a breakfast-eqsue course served in the hours of the evening topped with a light and snowy cheesiness. Definitely wanting some more now that I'm reliving it in writing :P! 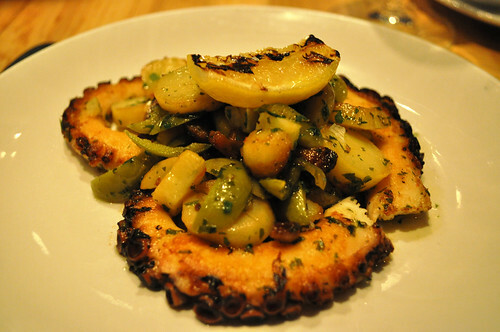 We also shared the charred octopus with potatoes, chilies, olives, and pancetta as a starter. The chilies certainly added a popping kick to this course. The starch from the miniature potato cubes countered the octopus's overall spiciness, providing some relieve for those (like me) who are not equipped to brave the weathering elements of the Scoville scale (no matter how mild the circumstances may be). The pancetta gave a complementing crunchiness to the charred exterior of the octopus, and the roasted lemon added a smokey-flavored lemon juice to top it off. My only complaint here was that the dish came served to us on the cooler side. Warmer octopus could have made this course even more delicious. 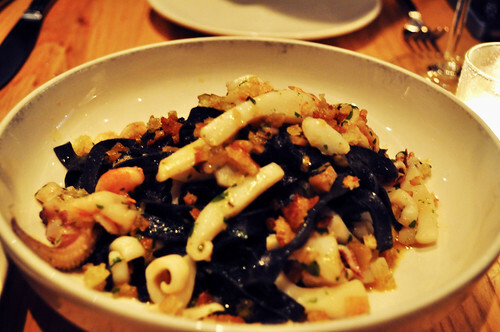 As for main course, we were immediately enticed by one of the specials offered that night -- the squid-ink fettuccini with squid, shrimp, and chorizo. While the squid ink did provide a deep haunting color for the fettuccini, I didn't perceive much of a taste differential against plain fettuccini. Nevertheless, Christine and I still really enjoyed this pasta dish very much, especially with the medley of tender and flavorful seafood swimming in tangled strands of darkened fettuccini. Each morsel of shrimp and squid were soft on the palate -- buttery with some savory and salty mixed in from the chorizo bits. I could eat this pasta dish for days -- it was definitely sad to see the bottom of the bowl. Again with this course as with the charred octopus, it would have been more optimal if it was served hot (it was a bit tepid once it reached us). 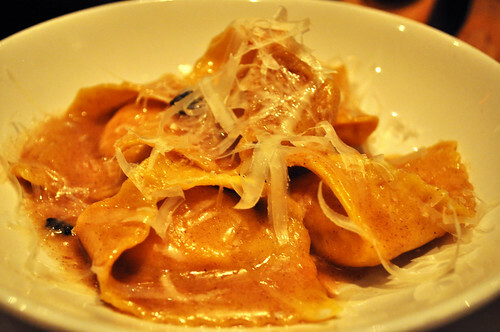 Also another recommendation from our waiter was the cappellacci with autumn squash, sage brown butter, and pecorino cheese -- a classic dish from the Emilia-Romagna region of Italy. Though this was a vegetable-focused pasta, my usual craving for a heavier protein did not surface at all. The butternut squash purée inside these generously sized pillows of cappellacci (Italian for "small hats" due to its resembling shape) were rich, buttery, and savory -- enough to compensate for any absence of meat. The thinly shaved strands of pecorino gracefully rested on top of the warm cappellacci, as it changed from a barely solid state to a delicate melted coating over the pasta. The sage brown butter brought it all together nicely with an evenly earthy creaminess. The packets of squash were nice and warm, but I felt the circumference/edges of the cappellaci were a bit undercooked -- almost al dente. If they were cooked for a few more seconds, they would have been perfect. Luckily, everything else was so lovely that the issue was almost an afterthought. 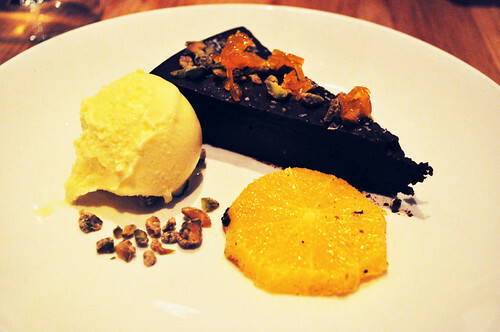 For our last course, our dessert was the dark chococolate truffle cake with pistachios, oranges, and gelato of sabayon (i.e., a frothy sweet sauce of egg yolks, sugar, wine, and flavorings, whipped while being cooked in a water bath). What do I always look for in a dessert, you might wonder. Chocolate? Check. Nuts (pistachios, hazelnuts, and/or almonds will do!)? Check. Churned happiness (gelato, ice cream, crème fraîche, and sorbet all apply!)? Check. It was between this dessert and the hazelnut chocolate torta with praline crunch and salted caramel gelato. The former won, mainly because Christine and I were very curious about the sabayon gelato -- the latter would've been perfect if the other choices appeared to be on the more mediocre side. The truffle cake and all of its scrumptious trimmings was ultimately a deconstructed Pepperidge Farm orange Milano cookie. I couldn't have asked for a better dessert! The dark chocolate was richly bittersweet -- very dense, I must say. Pistachios, always a great addition to any dessert, were well toasted and crunchy, while the orange and candied orange bits gave an overlay of tangy and citrus flavors to complement the bittersweetness of the dark chocolate. The gelato also balanced out the richness of the aforementioned ingredients with the creamy and delicately sweet sabayon base in the gelato. Findings: All in all, Christine and I really had a terrific dinner at L'Artusi, even on a Sunday night! The service was welcoming and helpful without interrupting the course of the meal and our conversation -- very important when you're meeting up for dinner to catch up with each other! The food was surprisingly impressive, leaving you wanting just a few bites more once the dishes are wiped clean from our inner hungry diner. One thing to note is that Chef Thompson is a bit "pancetta-happy" on L'Artusi's menu -- nothing to complain about on my end because to me, bacon makes anything and everything better, and pancetta is ultimately Italian bacon for me! If I could say two things the restaurant could improve upon to become the best of the best would be, firstly, somehow ensure the dishes get expedited more quickly to the diners who ordered the said dishes, and secondly, to make sure any pastas (specifically the cappellacci) is indeed cooked al dente (and not under cooked). Price point: $17-18 for each first course, $16-25 for each pasta, $10 for dessert.